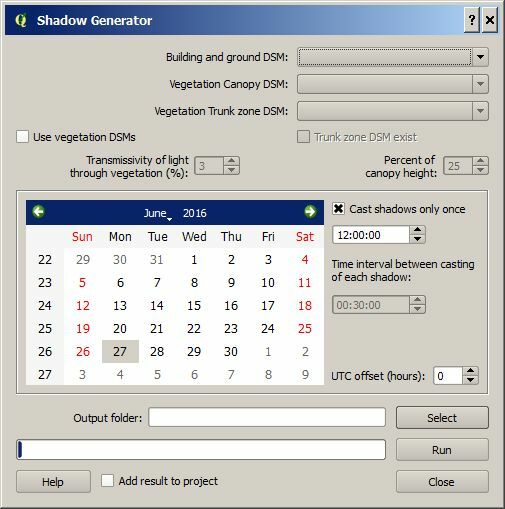 The Shadow generator plugin can be used to generate pixel wise shadow analysis using ground and building digital surface models (DSM). Optionally, vegetation DSMs could also be used. The methodology that is used to generate shadows originates from Ratti and Richens (1990) and is further developed and described in Lindberg and Grimmond (2011). Position of the Sun is calculated using PySolar, a python library for various Sun related applications ((http://pysolar.org/)). A DSM consisting of ground and building heights. This dataset also decides the latitude and longitude used for the calculation of Sun position. Tick this box if you want to include vegetation (trees and bushes) when shadows are generated. The data need to be set in the middle section. Tick this box if you only want to cast one shadow. Below this tick box you can set the time that is needed to decide the position of the sun. If the above tick box (Cast shadows only once) is not ticked in, a number of shadows is generated based on the interval set. Time zone needs to be specified. Positive numbers moving east(e.g. Stockholm UTC +1). A specified folder where the result will be saved. If ticked, the shadow raster will be added to the map canvas. If only one shadow image is generated, one geoTIFF will be produced where pixel values of zero indicates shadow and one indicates sunlit. If daily shadow casting is used (Cast shadows only once ticked off), one shadow image for each time step as well as one shadow fraction image is generated. The shadow fraction image is given in percent where 100% meaning the a pixel is sunlit throughout the day used in the calculation. Fig. 4.8 Shadow image in Gothenburg (1 m resolution), Sweden at 1 pm on the 2nd of October 2015 (daylight savings time).